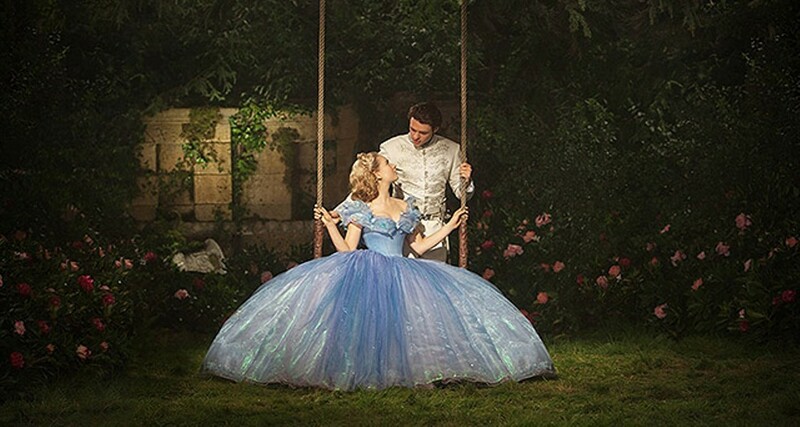 PHOTO COURTESY WALT DISNEY STUDIOS Lily James and Richard Madden in "Cinderella." Diverging from the blatant revisionism of Disney's recent live-action fairy tales, director Kenneth Branagh brings a pleasingly straightforward adaptation of the "Cinderella" fable to the screen. Though inspired by Charles Perrault's classic telling, Branagh is clearly using Disney's beloved 1950 animated version as a template, following that film's model quite closely (right down to Ella's close relationship with the resident mouse population). This is a movie whose trailers literally summarize the entire story, as if to say, "Look, we know that you know exactly what's going to happen, but just look how freakin' pretty it's going to be!" Though missing the distinctly feminist bent of Disney's recent output like "Brave," "Frozen," and most notably "Maleficent" (a movie I didn't terribly care for, but for reasons other than its strong female characters), Branagh goes for tradition over deconstruction, presenting a lush, unironic adaptation. The result is slight but captivating, proving that even after umpteen adaptations of the tale, "Cinderella" still holds the power to delight. Or maybe after this endless winter, I'm desperate for a break from gray skies and slush: With its saturated colors and green foliage, the film screams warm spring weather, and it is glorious to behold. You know the story. After the death of her sweet mother (a nearly unrecognizable Hayley Atwell, Marvel's "Agent Carter") and father (Ben Chaplin), a young maiden named Ella (Lily James) is left in the care of a cruel stepmother (Cate Blanchett, going big -- but never campy -- with the role) and obnoxious stepsisters (Sophie McShera and Holliday Grainger), who treat her as a servant and bestow the mocking "Cinder" prefix to her name. There's also a handsome prince, a Fairy Godmother (a daffy Helena Bonham Carter), and a pumpkin in there somewhere. James finds subtle layers of personality in a character who's defined so much by her role as a passive doormat. Ella's got the kindness thing down pat, it's the path toward courage that marks the character's true arc. Writer Chris Weitz also fleshes out the backstory of several characters, giving Blanchett's Lady Tremaine a bit more motivation for her cruel behavior and adding some needed development to Prince Charming. Weitz crucially adds a scene in which Ella and the prince, Kit, meet in the woods before he sets eyes on her at the ball. She gains his interest by defending a stag from his hunting party, and the pair share some flirty banter. Taken with Ella (who doesn't give him her name), the prince then arranges the ball in order to suss out the identity of the mystery girl. Kit is winningly played by Richard Madden ("Game of Thrones"), and even though he's missing his trademark Robb Stark scruff, (meaning that we've been sadly deprived of the first bearded Prince Charming), he and James share a chastely sweet chemistry. The touching relationship between Kit and his father (Derek Jacobi) is another nice addition to the story. Like most fairy tales, this "Cinderella" is not subtle about making its moral plain to us. Before her death, Ella's mother makes her vow to "have courage and be kind." The words might seem trite, but as far as morals go, you can do a lot worse: Are there any more basic guidelines to teach children in order to give them the building blocks to becoming a decent human being? These slight tweaks to the story go a little ways in alleviating the tale's retro gender politics. Ella's character still has frustratingly little agency of her own, but Weitz's script finds ways to make her kindly nature feel less passive. Putting up with the abuse becomes a conscious decision born out of her desire to remain in a home that's filled with the memories of her dear departed parents. Branagh's film is thankfully not as reliant on CGI effects as most recent live-action fairy tales. There's still quite a lot, but what's there is infinitely more visually appealing than the hideous creations of Tim Burton's "Alice in Wonderland," and that's largely thanks to the wonderful production design by Dante Ferretti ("Hugo") and Sandy Powell's endlessly colorful costumes. There's a bit too much screen time devoted to the digitally animated mice, and the film's attempts at humor can be rather hit-or-miss, but "Cinderella" always looks gorgeous -- the centerpiece sequence at the ball is particularly lovely. Delightfully old-fashioned, Disney's "Cinderella" overcomes its story's familiarity through sheer enchantment. A note: "Cinderella" plays with the animated short "Frozen Fever," a charming but inessential chapter in the "Frozen" universe, revolving around a birthday party for Anna, one forgettable song, and a cute, highly marketable new character. Running only seven minutes, the short manages to throw in everything memorable about the first film, and with the recently announced sequel still at least a couple years away, it functions as a serviceable way to tide fans over.